In Sierra Leone, Education is important but not always available to everyone. This is unfortunate. Nazareth House is striving to give the gift of education to as many as possible. We have a long long way to go, but we have accomplished many steps forward on this matter. The school in Kabala is functioning and I have reports this morning that the children are in the middle of exams. In Freetown, schools are available to those who can pay the high fees. God's generosity, through you, has provided many students in Freetown with education. We have provided education at all levels including early pre-school, as well as elementary, high school and college. 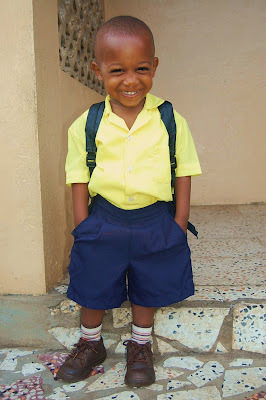 In a climate such as it is in 3rd World Countries, it is important to begin the formal education early as possible. You never know when the chance for learning will be interrupted or unavailable. 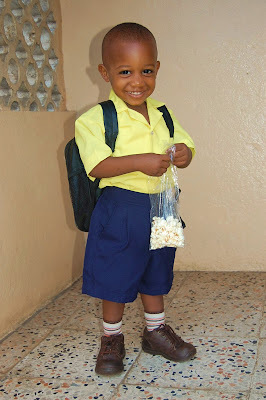 Therefore, Little Roo has begun his pre-school education complete with uniform and bag of popcorn for lunch. Isn't he adorable? 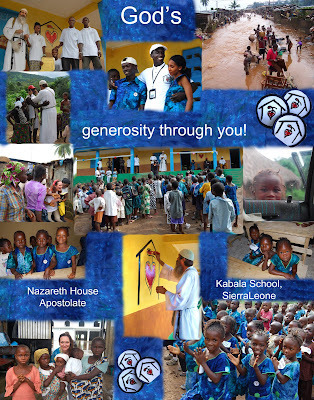 Thanks to all of you that contribute to NHA to help bring brighter futures to several in Sierra Leone. Thank you for believing Education is important. Without it, there is little hope for the people of Sierra Leone to better their life. Please continue your support to keep them in school and benefit those who only dream of going to school. The above Poster was designed by Aleica Willis: LizzyThomasPhotography for NHA. James Bombolia Mansaray, Nazareth House Hero!